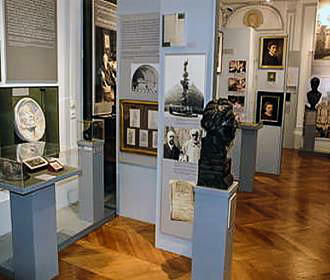 Adam Mickiewicz was a Polish poet who resided in Paris for a part of his life, and the museum located within the Polish library in Paris was created by his son and includes much memorabilia and personal items along with historical documentation regarding emigration and the struggles Adam had during his life. The first museum to be opened within the Bibliotheque Polonaise in Paris was opened on 3rd May 1903, which is called the Musee Adam Mickiewicz and it was created by his eldest son Wladyslaw Mickiewicz. This museum in Paris is dedicated to the Polish poet Adam Mickiewicz and contains lots of personal memorabilia, documents, letters and correspondence along with manuscripts, portraits and souvenirs that were either collected by him or were produced by him personally. 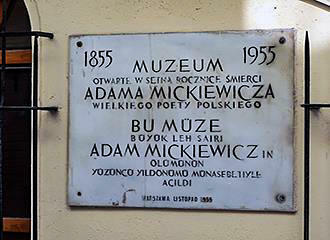 Yet there are also many other items to discover that relate to his time as a publicist, plus as the romantic Polish poet that he has become recognised for, along with when he was involved with political activity, but many of the exhibits within the Musee Adam Mickiewicz also have a historical value. Also the work of Adam Mickiewicz has inspired many composers, painters, writers, poets, and sculptors from numerous countries and you will be able to see monuments and visit museums dedicated to him in lots of cities, especially in Poland. 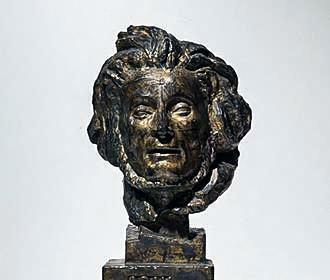 And in fact, there is a monument in Paris that was produced by Emile Antoine Bourdelle, who was captivated by Adam Mickiewicz's works. Yet he was also a close friend of David d’Angers and there are many sculptures, lithographs and watercolours by David that are located within this museum. Yet you can also find numerous others by this same artist at the Musee Carnavalet, which traces the history of Paris, and also several art works from David d’Angers that are within the Musee de la Vie Romantique museum or sculptures located within the Pere Lechaise cemetrary, just like the bronze bust of Honore Balzac. 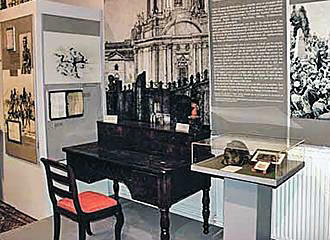 But there are also some other unusual and rare items to be found at the Musee Adam Mickiewicz, including a medal executed by a French artist dedicated to the glory of three college professors, one of whom was actually Adam Mickiewicz, and there are other humble family objects on display as well. You will find this museum located on the Ile Saint Louis island right by the River Seine on the Quai d’Orleans within the Bibliotheque Polonaise Polish library, and it is open from 2.15pm through to 6pm on a Tuesday to Friday, but the Musee Adam Mickiewicz is closed on all other days including National French holidays. As of 2014 the cost of entry is €5 for adults, however those up to the ages of 18 have free admission, yet students and old age pensioners get a reduction of only €2, plus groups of up to 12 people pay a total of only €25. You may be pleased to know that guided tours are also available by prior reservation, although at present these are only conducted in either French or Polish, and are an additional cost of €2 per person on top of the rates mentioned above. Now when it comes to public transport in Paris, there is not actually a Metro station on the Ile Saint Louis, so the nearest station is the Pont Marie stop via line 7 and you would then have to cross the Pont Marie bridge and go to the opposite side of the island. However, the bus number 67 will get you close by, and there is also a Batobus water bus docking station on the bank opposite Notre Dame Cathedral on the Ile de Cite, which is the island in the River Seine next to the Ile Saint Louis.